Mitchell Johnson, Kumar Sangakkara and Angelo Mathews have been nominated for two of the top International Cricket Council awards. 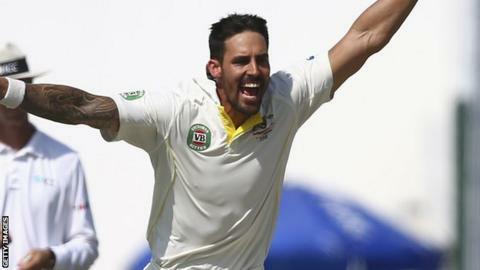 Australia pace bowler Johnson is in contention for the cricketer and Test player of the year awards. Sri Lanka batsman Sangakkara and captain Mathews are also up for both. South Africa's AB de Villiers completes the cricketer of the year nominees, while Australia opener David Warner has been nominated for the Test award. England batsman Gary Ballance and all-rounder Ben Stokes have been nominated for the emerging cricketer of the year award. England captain Charlotte Edwards and team-mate Sarah Taylor are in line for the women's one-day international prize, although Edwards missed out on the people's choice award, which went to India bowler Bhuvneshwar Kumar. Stuart Broad and Joe Root have been named in the Test team of the year, but no England players feature in the ODI XI. The winners of the awards, based on performances between 26 August 2013 and 17 September 2014, will be announced on 14 November. Australia captain Michael Clarke was named cricketer and Test player of the year in 2013. Johnson won the award in 2009 and Sangakkara in 2012. No player has won the award twice.